Despite the fact that a lot of gold was found both by prospectors and mining companies in Australia in the latter part of the 19th century with large goldfields discovered rivaling those found in the USA there is still a lot of gold that can be found there today. In fact it is estimated that $150 million dollars worth of gold is being discovered here using metal detectors each year! The reason for this s quite simple due to the fact that the Australian goldfields cover huge, often remote, land areas in each State and modern technology has improved the chances of finding gold nuggets in Australia missed by the old prospectors. Part time prospectors and hobbyists, estimated to currently number 20,000, are still unearthing some very nice gold nuggets out in the wilderness using metal detectors, pans and other types of gold finding equipment. 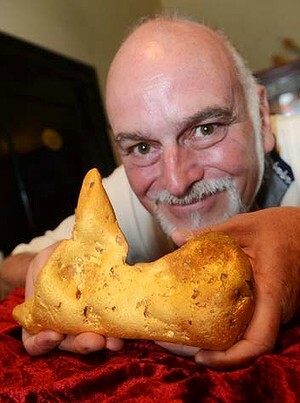 Here is a example of one huge nugget recently found near Ballarat in Victoria weighing 177 ounces and worth over $300,000! There is a good reason why so many people are taking up gold prospecting as a part time hobby for finding gold nuggets in Australia. 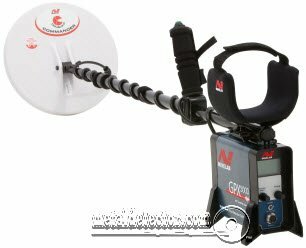 Over the last decade gold has steadily increased in value and is now valued at over $1600 per ounce with many being tempted to purchase good quality metal detectors and other prospecting equipment hoping to strike it rich! However the most difficult part of gold prospecting is finding the right location to work. To overcome the problem any people are joining gold prospecting clubs because this allows them to use the club’s pegged areas where members have previously discovered gold. There are also those who prefer to travel by themselves to remote potential gold bearing regions hoping to find new pockets of gold. One thing is certain – the location of rich finds are always kept a closely guarded secret! Having done some preliminary research you should generally choose areas where previous prospectors have found gold. There are always tell-tale signs of old gold diggings such as mullock heaps and uneven ground at these locations. Other signs like rocks lying on the sides of gullies and creek beds and gullies are also likely evidence of previous prospecting activities. It is also worth investigating old shafts and piles of quartz. Talking to people who live in these regions may also reveal worthwhile spots to check where others have previously been successful in finding some gold. One thing to be pointed out is that although an area may have been extensively worked over previously, by using the latest high-tech metal detectors there is a high probability that you will find gold gold missed by others who used the earlier-model detectors. These new hi-tech detectors with their ultra sensitive gold seeking features will often find tiny or deeper nuggets that the older older machine models weren’t capable of detecting. There is a good possibility of finding gold nuggets in the mullock heaps of old diggings, so you should ensure that these are carefully and thoroughly gone over with your metal detector to maximize your chances of finding any nuggets missed by previous prospectors. However there is probably far more gold left in ground that hasn’t been worked over and this is where rich strikes can be made. Usually the prospector will need to gain more experience to recognize a good untapped location on which to prospect by searching for good indicators such as scattered quartz or deposits of ironstone or shale. It is advisable to search in the undisturbed ground in the immediate vicinity of these workings if the ground is still hard or rocky. In the past this unworked ground may have been too poor for previous prospectors to mine, but may now prove to be more productive to you with armed with the latest in metal detecting technology such as detectors in the Minelab GPX pulse induction series, which are ideally suited for Australian ground conditions. This type of detector will penetrate the ground deeply to find any gold that the old prospectors left behind. Western Australia, my home state, has one of the world’s largest gold bearing region covering an area of several thousand kilometers and extending from Mount Newman in the north of the state all the way down to Norseman near the south coast. The area around Kalgoorlie is well known for the huge gold discoveries that occurred in the latter part of the 19th century and which continue even today from deep mining techniques carried out by large mining companies..Large amounts of alluvial gold have been found in the Pilbara area of the state and for part time prospectors there are still plenty of gold nuggets to be found. Areas where gold has been found in this state include:- The Darling Ranges, Boddington, Donnybrook, Kalgoorlie, Norseman, Menzies, Leonora, Laverton, Wiluna, Leinster, Sandstone, Mount Magnet, Cue, Meekatharra, Cobra Station, Mount Newman, The Ashburton River, Karratha, Roebourne, Nullagine, Marble Bar, Halls Creek, Great Sandy Desert – Telfer and Ruby Plains. Victoria probably ranks second to Western Australia in relation to gold discoveries and has produced some of the largest nuggets in Australia. 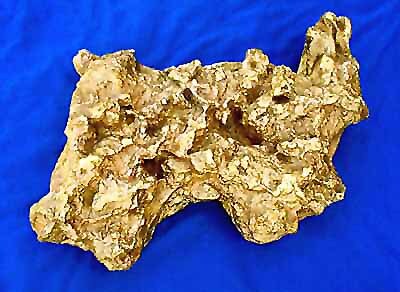 As an example the “Welcome Stranger” was the largest gold nugget ever discovered, and was unearthed by two prospectors in 1869 at Moliagul, Victoria. At that time no scales were capable of weighing a such a large nugget, and so it was broken up into three pieces. Goldfield areas in the state include Ararat, Stawell, Ballarat, Avoca, Dunolly, Wedderburn, Clunes, Bendigo, Rushworth, Castlemaine, Mansfield, Alexandra, Beechworth, Bonang, Bright, Benalla and Glen Willis. Large nuggets are still being found in 2016 in Central Victoria by prospectors using metal detectors. This was the state where gold was first officially discovered in Australia 1823 in Australia in 1823 near Bathurst. The news of the discovery was suppressed at the time by the Colony’s government to avoid disruption to the relatively small community. News of the finds were only proclaimed after people began leaving Australia to seek there fortunes elsewhere after heatrng of the Californian gold discoveries in 1848. Gold bearing regions within the state include Tibabooburra, Broken Hill to Menindee, Cobar, Canbelego, West Wyalong, Temora, Young, Braidwood, Albury, Kianora, Eden, Bega, Gulgong, Mudgee, Hill End, Sofala, Bathurst, Nundle, Tamworth, Bingara, Armidale, Ullara and Drake. The first major gold rush in the state was in 1858 at Bonnie Doon Creek 35 miles north of Rockhampton. By 1860 some 40,000 ounces of gold had been discovered and there were over 16,000 people on this goldfield at its peak. The gold regions within the state are are: Cloncurry, Georgetown, Forsayth, Croydon, Percyville, Wenlock, Cohen, Maytown, Palmer River, Charters Towers, Ravenswood, Mackay, Clermont, Rockhampton, Maryborough, Gympie and Stanthorpe. The first commercial goldfield in the NT was developed from 1871 in the Pine Creek region, where it has continued until the present day. Gold regions within the state are: Adelaide River, Brookes Creek, Pine Creek, Wandi, Tanami, Rabbit Flat, The Granites, Tennant Creek and Arltunga. Gold was first discovered in the state in 1846 at the Victoria mine near Castambul, City of Adelaide where a 12 ounce nugget was dug up. However it was not until 1852 that the first official gold rush commenced in the state at Euchunga in the Mount Lofty Ranges. The mine produced 3100 kgs of gold. Goldfield areas within the state are: Euchunga, Barossa, Teetulpa, Tarcoola, Muckanpippie, Peake Diggings, Leigh Creek, Burra, Peterborough and Wadnaminga. Gold regions within the state are: Corinna, Moina, Queenstown, Urquhart, and Mainwaring Rivers, Beaconsfield, Lefroy, Lisle, Forrester, Gladstone, Fingal, Mathina and Cygnet. Make sure that you don’t prospect on mining tenements, national parks or other private property unless you have sought and obtained permission to search there. Any illegal activity on your part can spoil the pleasure of other part time gold prospectors if your actions cause a complete prospecting ban being imposed by the land owners. Enjoy finding gold nuggets in Australia on your next prospecting trip! This entry was posted in finding gold, finding gold in Australia, finding gold nuggets in Australia, Uncategorized and tagged finding gold, finding gold in Australia, finding gold nuggets in Australia by Jim. Bookmark the permalink.